For those tired of high-maintenance and short-lived plants, Chris Wiesinger, “The Bulb Hunter” shares his knowledge of versatile, sustainable, and low-maintenance bulbs. Heirloom Bulbs for Today introduces the best of the bulb world, addressing common questions and explaining the characteristics, history and ways to use each bulb, whether in the landscape or the home. Chris teams with landscape designer and award winning author Cherie Foster Colburn (Our Shadow Garden) to offer an innovative look at old-fashioned flower bulbs. While most garden guides simply tell the culture of the plant, Heirloom Bulbs for Today also tells the culture of the people who grew the plant, unearthing each bulb’s past and those who loved it. Gorgeous botanical illustrations and vivid photographs by South African artists Loela Barry and Johan Kritzinger add rich flavor to featured bulbs found flowering with abandon in historic gardens, homes, and cemeteries, transporting readers on their own bulb hunt. With undeniable Southern charm, Wiesinger describes the adventures he encounters while collecting these old favorites, dubbed the “comfort food” of the plant world. Heirloom Bulbs for Today introduces new gardeners to the best of the bulb world and shares information that will delight even the most seasoned gardeners. Hunting bulbs is hard work, and Chris’ search for these hardy favorites – the comfort food of the plant world – take him into every corner of the world to find these treasures and the stories behind each one. Detailed botanical portraits and Chris’ intimate secrets of how to know and grow his “ladies” give readers every tool they need to be successful. Vivid photographs of the bulbs flowering in historic gardens, homes, and cemeteries transport readers on their own bulb hunt throughout the country. With Cherie’s sample landscape plan using these carefree plants, Loela takes readers through every season of the year to see what the garden will look like in bloom. Easy to follow instructions on forcing bulbs inside and step-by-step photos to create your own floral art lets everyone become a bulb gardener, even if you don’t have a yard! That first rescue hunt took me to a little German community less than an hour away from Texas A&M, where I went to school. I’d heard this used to be the third largest town in Texas, but there wasn’t much there anymore. In the early 1900s the area was littered with cotton plantations. The town’s success rode on the back of the Southern Pacific rail line that hauled cotton to the East coast. It was known for its beautiful Victorian homes built during the cotton era. Each fall, the crimson blooms of the oxblood lily, Rhodophiala bifida, emerged around the oak trees and next to these stately homes. When I began my search of the oxblood lily, also called the schoolhouse lily because of the timing of its bloom at the start of the school year, my mentor and friend, Dr. Bill Welch, who had done extensive research on the heirloom plants found in Texas, shared his knowledge with me. Although many people believe the oxblood lily to be native to Central Texas, it was actually an introduced plant from Argentina brought by colonist and German-born botanist/farmer Peter Heinrich Oberwetter. Upon Oberwetter’s arrival to Texas in the late1840s, he started a collection of native rain lilies and began sending them out to friends all over the world. When the Civil War broke out, he sided with the Union, probably because political upheaval had sent him packing from Germany in the first place. Like many other German colonists, Oberwetter fled to Mexico to escape persecution. Most likely in Mexico he first saw a version of the oxblood lily that became one of his passions. Returning to Texas after the war, he brought with him a number of different bulbs, but the oxblood lily is the plant most commonly associated with his legacy as a plantsman. 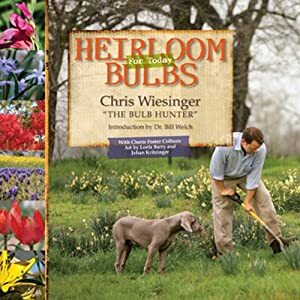 Called “The Bulb Hunter” by the New York Times, Chris Wiesinger is known for his relentless pursuit of heirloom bulbs and his desire to understand their history. Chris earned a degree in horticulture education at Texas A&M University and is owner of The Southern Bulb Company. Cherie Foster Colburn, who also attended Texas A&M and Texas Woman’s University, is an award-winning garden writer and children’s book author (Our Shadow Garden, illustrated by children in treatment at M. D. Anderson Cancer Center). As a professional landscape designer and owner of Nature’s Tapestry, Cherie specializes in low-maintenance residential and commercial plans.